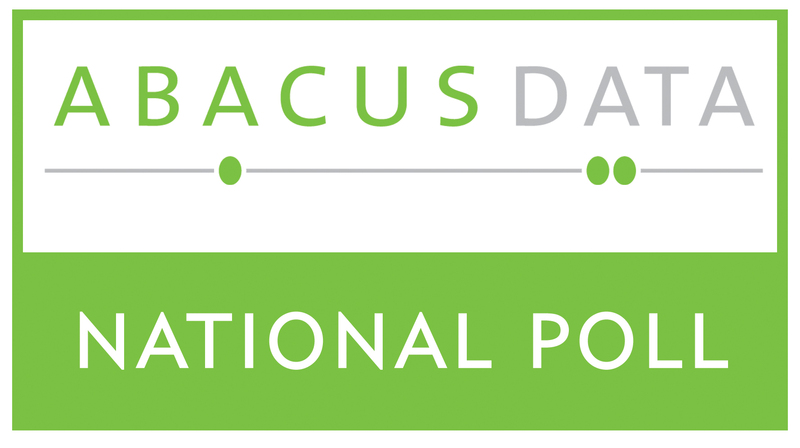 A new national survey by Ottawa-based Abacus Data finds that the Conservative Party holds a 15-point lead over the Liberal Party among decided voters. Nationally, the Conservative Party was the choice of 38% of decided voters while 23% of Canadians said they would vote Liberal. 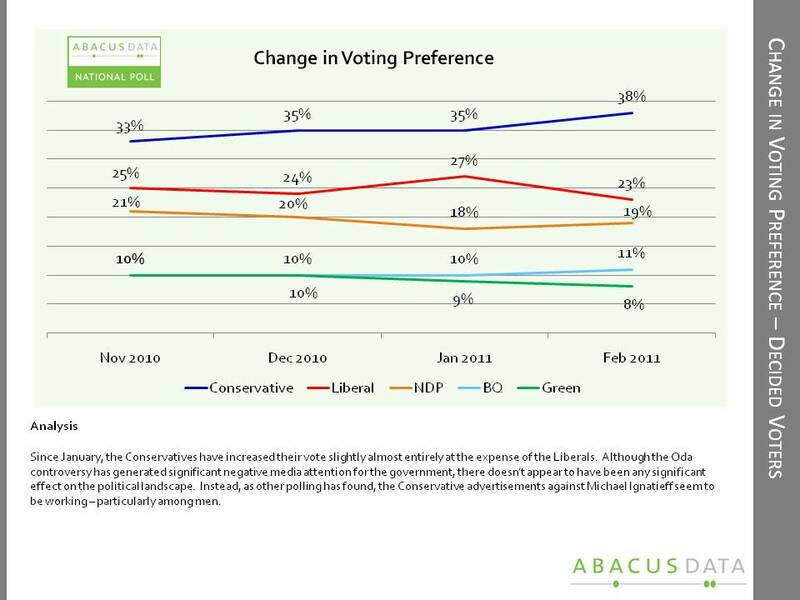 The NDP was at 19%, followed by the Bloc Quebecois at 11%, and the Green Party at 8%. Nineteen percent of respondents were undecided. Despite the controversy surrounding Bev Oda and altered documents, the Conservatives remain in a strong position nationally. Although we found much of the Conservative gain centred in their heartland of Alberta, the party now has a 10-point lead in Ontario due to a decline in Liberal support. In battleground Ontario, the Conservatives have the support of 39% of decided voters, followed by the Liberals at 29% and the NDP at 18%. Quebec remains relatively unchanged from January with the BQ in a dominant position with the three federalist parties still sorting themselves out. If the Conservative ads against Mr. Ignatieff are the cause of the Liberal slide, it may be because they have targeted men. Our data finds that Liberal support among men is down by five percentage points. The survey also looked at the public’s awareness of the Bev Oda controversy. We asked respondents whether they knew who Bev Oda was and then asked why she was “in trouble”. Nationally, a small majority of Canadians surveyed (54%) said they did not know who Bev Oda was while 46% were able to identify her as at least a federal politician, a Conservative cabinet minister, or a federal cabinet minister. This indicates that although there has been widespread attention to the issue, a majority of Canadians surveyed do not know anything about the issue when unprompted about it. 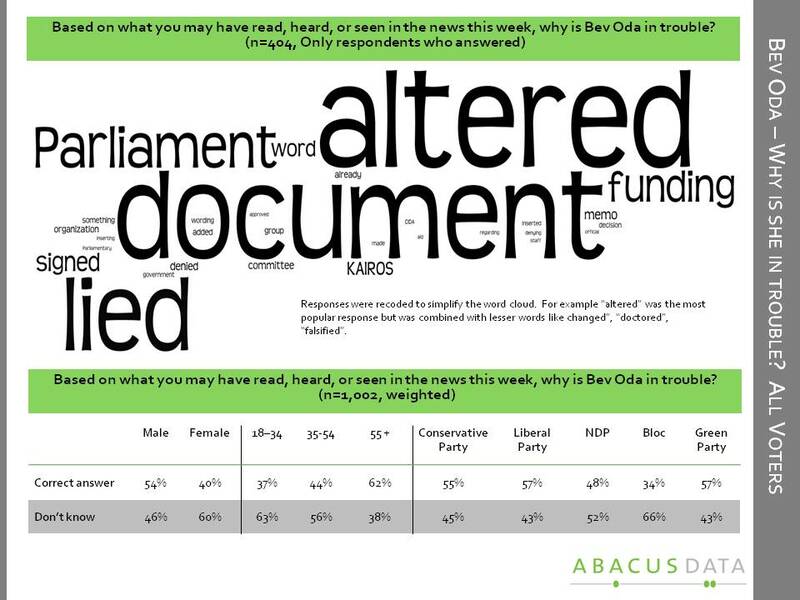 When asked why she was in trouble, 46% correctly identified some aspect of the Oda controversy whether it be altering documents or “lying to Parliament”. The link between knowing who Bev Oda is and what she did indicates that the controversy has reached a certain level of awareness but based on the partisan differences and voting intentions, the issue does not seem to have changed very much. Looking at partisan differences, the survey found that Conservatives were just as likely to know who Bev Oda was and what she did as the supporters of opposition parties. Although opposition party supporters used more negative language when describing what she did, the data suggests that this issue has had little effect on the popularity of the Conservative government. If anything, the Conservative ads seem to have done their job in suppressing Liberal support. 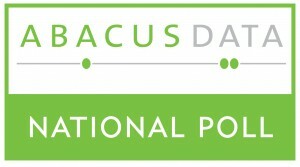 On February 23, 2011, Abacus Data Inc. conducted an online survey among 1,005 randomly selected Canadian adults from an online panel of over 100,000 Canadians. The margin of error—which measures sampling variability—is comparable to +/- 3.1%, 19 times out of 20. Results of the survey were statistically weighted by gender, age, region, and language using census data from Statistics Canada and by past vote using Elections Canada results from the 2008 General Election. Totals may not add up to 100 due to rounding.